Currently Working on: Promo for the release of STOLEN HEAT…NEXT TUESDAY! Mood: Getting excited, nervous, but ready for the book to be OUT. R-day is coming. Next Tuesday my second book, STOLEN HEAT, releases. I’ve been through this before. I know all about the “process”. And yet, with Release Day looming, I have the same jittery feelings I had seven months ago when STOLEN FURY hit store shelves. I thought I would be more relaxed this time around, but obviously I’m not. “Release day” is such a strange concept, don’t you think? STOLEN HEAT’s “street date” is Tuesday, July 28, 2009, but it’s been ‘In Stock’ on Amazon for over a week, and I’ve heard from booksellers in Australia who tell me the book is “Already selling well”. I’ll admit I don’t entirely understand the concept of “Street date or “Release Day” – if a box of books comes in it’s the bookseller’s decision whether to set it out early or not. Obviously, all sales count toward our sell-through numbers, but I’ve been told by other authors that books sold before Release Day don’t count toward list calculations, so authors are technically at a disadvantage if a bookseller is so excited about their book they want to get it out as soon as possible. Does that seem strange to anyone else? Of course, that’s only one part of this whole biz that confuses me, but it’s the one first and foremost in my mind today as I look ahead to release week. I imagine the way I’m feeling now is much like a parent feels when they send their baby off to college or out into the world. You hope and pray you’ve done all you can to make them the best they can be. Because from here on out, their life is out of your hands. I’m sure my anxiety will only peak in the next few days. Like I said, I’ve been through this before, but it doesn’t make it any less exciting. I have a gift certificate for a massage, which my hubby gave me for Mother’s Day that I never got to use, so I’m thinking Tuesday would be a good day to cash it in. Do something relaxing. Take my mind off “R-Day”. Ease the jitters. How about you? If you’re a writer, what do you do to ease your stress on Release Day, or do you not get nervous when your books are released? (If you don’t get nervous I wanna know your secret!) If you’re a reader, how do you deal with stress and anxiety over something big you’re looking forward to? Oh, and before I forget…in case you haven’t heard (and how couldn’t you???) 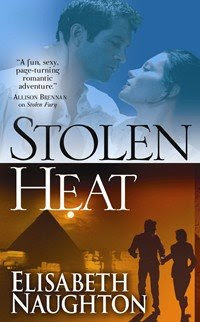 I’m giving away some BIG BIG prizes in anticipation of STOLEN HEAT’s release. Click the widget below or go to STOLEN HEAT CONTEST to enter for your chance to win a $100 VISA giftcard and a whole host of daily prizes!